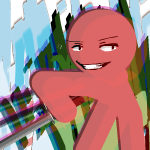 Extended Hanto : EVERY HANTO has a gimmick to extend the height that as long as an straight katana. it's work as same as police's portable Baton. There are 2 types of Hanto in combat, The effected is AoE. Duplicated knife that seems to be an illusion but deal with the real damage of average sliver knife. a) Beta Hanto has a range in effected around 2 miles, else the knife will be broken. c) All kinds of Hanto can do the teleportation. d) The forged sliver round/ball from Hanto is expectation for the range. e) All kinds of Hanto have the same element gimmick ability. Dirty Trick: Use everything around that's out of common sense to take the advantage. Dual Hanto, Sliver Japanese Knife that has ability to transfer/replace the location of Creature or object to a knife.